Lauren Faulkenberry: "I am a collector of words and objects, images and desires. Books are my way of preserving memory and felt truths. 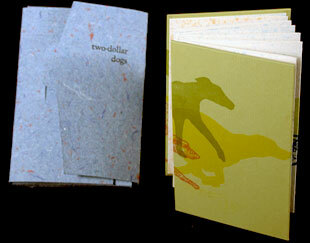 Firebrand Press produces books, prints, and ephemera that are letterpress-printed and hand-bound. The content is at times driven by images, at times by text, and invites readers to examine the experiences that have made them who they are and consider those things in their memory that they most want to preserve. " Whittier, North Carolina: Firebrand Press, 2016. Edition of 6. 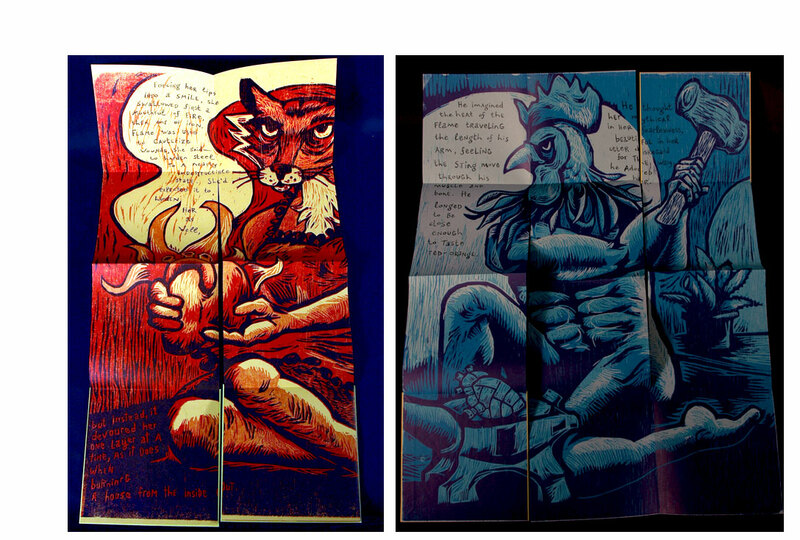 7.5 x 8.5"; one double-page opening with tunnel book on recto. Tunnel book extends to 10". Letterpress printed. Hand cut. 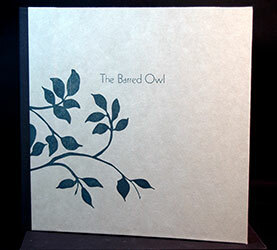 Bound in paper-covered boards with cloth spine. Slipcased. Signed and numbered by the artist. Lauren Faulkenberry: "Text compares a romantic encounter to the owl's ability to move through the darkness without making a sound." One night, you’ll lie awake next to the guy who’s supposed to help you get over the one that broke your heart–the first one who said, “I don’t love you anymore.” The space between you is the width of two hands, the width of an ocean. You’re as close as two wounded people can be, but this will mend nothing. No one can fix you. No man can heal you. Whittier, North Carolina: Firebrand Press, 2016. Edition of 10. 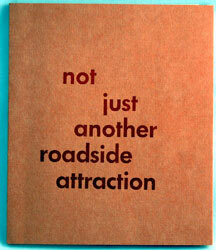 7.9 x 8.5"; one double-page opening with tunnel book on recto. Letterpress printed. Hand cut. Bound in cloth-covered boards with title label tipped on front board. Slipcased. Signed and numbered by the artist. The short text describes someone who "used to hate dancing" and stood in the corner not to be noticed. One night she is approached for a dance. In that one moment and dance she finds "all those things that you used to think mattered - in that moment you see that they never did." The story is illustrated with dancing blue-footed boobies. These birds live off the western coasts of Central and South America. Not surprisingly they have blue feet, which they show off to prospective mates in a high-stepping strut. [Iowa City, Iowa]: Firebrand Press, 2012. Edition of 30. 5.5 x 6.5"; 20 pages. Pressure prints based on Faukenberry's photos and drawings. A collagraph layer for texture. Letterpress printed on French paper. Drumleaf binding in paper wraps. Lauren Faulkenberry, Introduction: "In the summer of 2011, I traveled to historical sites in the southwest that inspired me because of the way they had been revived. The history and integrity of the buildings had been preserved in a way that now benefits the surrounding community. Often it seems that historical and cultural landmarks are preserved in a way that makes them more like museums - they become shells of the buildings they once were, and stand silent as tombs. But some of the sites I found on this tip have been resurrected - they maintain their histories while acting as a relevant and vibrant part of the community. I was moved by this transformation, and the people behind it. This book highlights eight locations that are a testament to the spirit of innovation and preservation." The sites Faulkenberry features: Pearl Brewery in San Antonio, TX; Ghost Ranch in Abiquiu, NM; Jingu Tea Garden in San Antonio; Turquoise Trail in Madrid, NM; Randall Davey Audubon Center in Santa Fe, NM; Salida Steam Plant in Salida, CO; Southwest School of Art in San Antonio; and Fuller Lodge in Los Alamos, NM. Gordo, Alabama: Firebrand Press, 2011. Edition of 45. 5.5 x 8"; 72 pages. Letterpress printed with photopolymer plates. 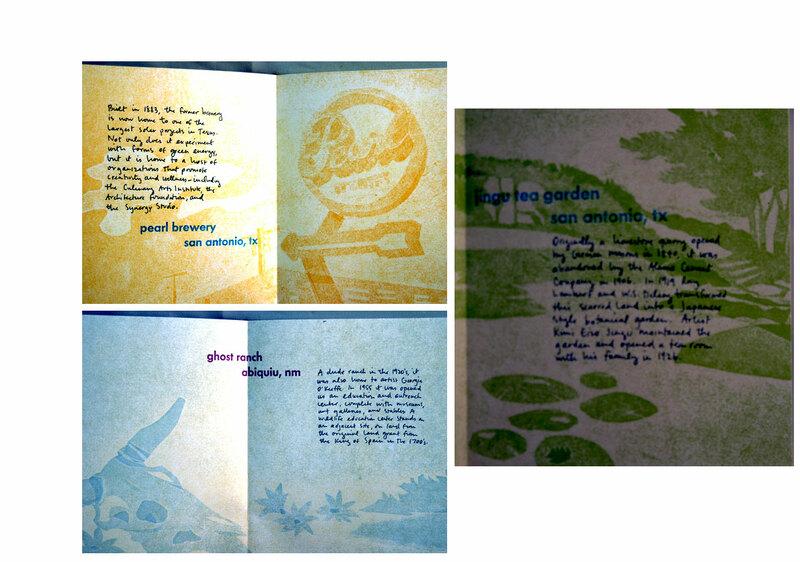 Printed on handmade papers made of abaca, cotton rag, kozo, and corn from the artist's father's garden. Perfect bound paper over boards. 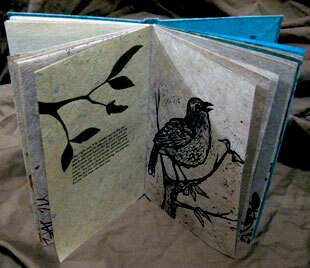 Text, images, printing, and binding by Lauren Faulkenberry. Firebrand Press: "This book is comprised of two narratives. One is a collection of anecdotal stories that allude to romantic encounters that the narrator experienced or imagined. The other is based on observations of bird behavior that mirror the behavior of the narrator." Tuscaloosa, Alabama: Firebrand Press, 2010. Edition of 70. 6.75 x 6.875 x 1.25"; 3 books, each a single sheet folded. 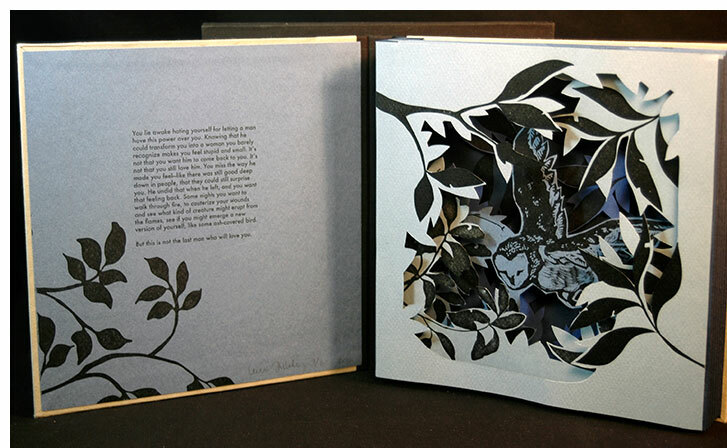 Two of the books open to 18 x 24" and one opens to 12 x 24". Images created using woodcuts and photopolymer plates. Housed in clamshell box. 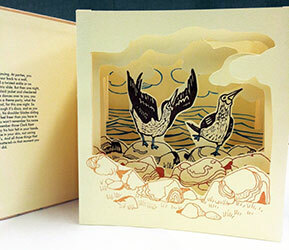 Text and illustrations by Lauren Faulkenberry. Firebrand Press: "This is a series of three books, titled Smolder, Galvanize, and Devour. With a structure similar to a map fold, each book is printed on a single 18" x 24" sheet that collapses to 6" x 6". "Based on the mythology of the Greek furies, this trilogy explores themes of heartache, longing, and obsession, and describes how it feels to be set aflame by another." 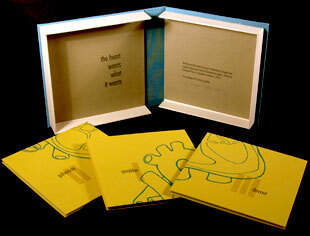 The books and box can be arranged so that the cover drawings on each combine to form the image of a human heart. Tuscaloosa, Alabama: Firebrand Press, 2009. Edition of 35. 3.5 x 5.25" closed, 42" extended; 14 pages. Accordion structure with end papers attached to boards. Letterpress printed with photopolymer plates. Paper: Somerset velvet. Typeface: Californian. 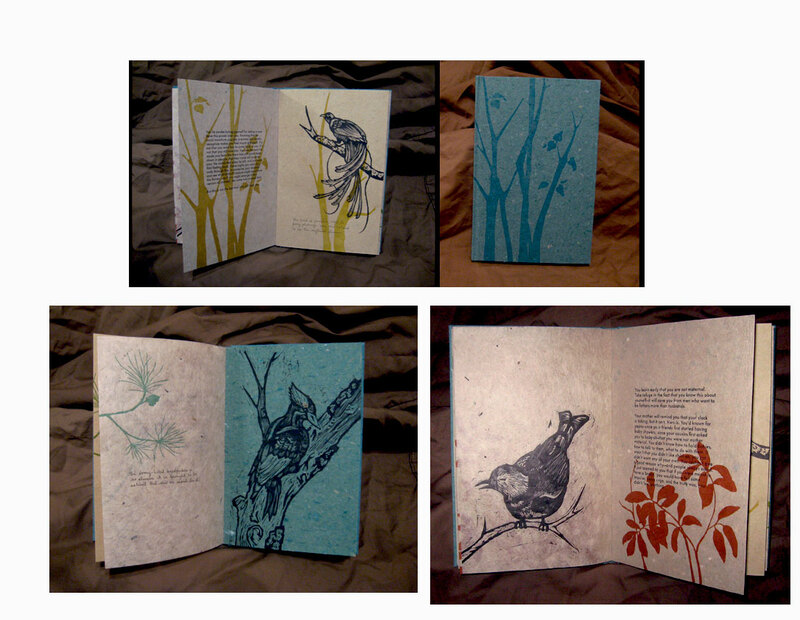 Images printed from photopolymer plates; the cover stock handmade by the artist. Housed in a protective wrapper of 100% cotton handmade cover stock made by the artist. 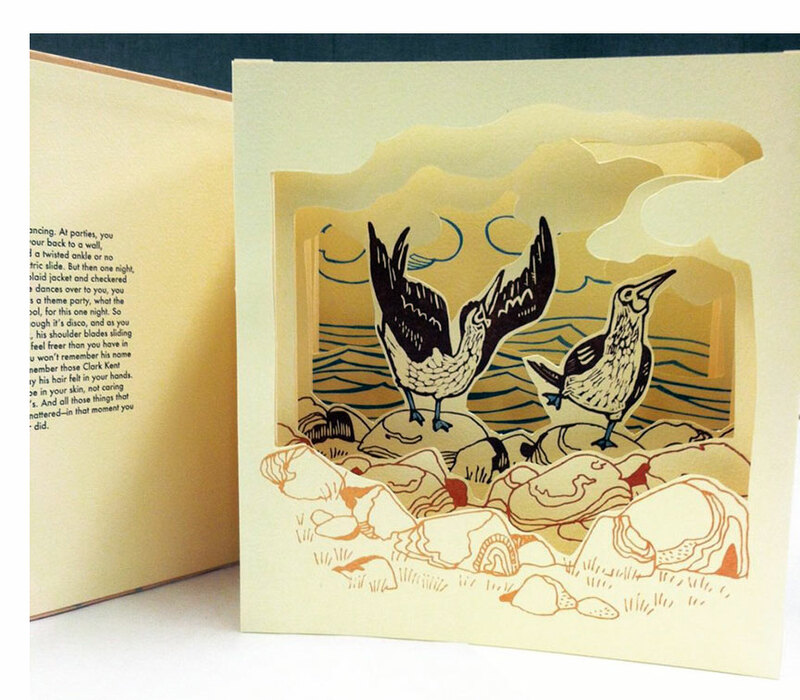 Text and illustrations by Lauren Faulkenberry. 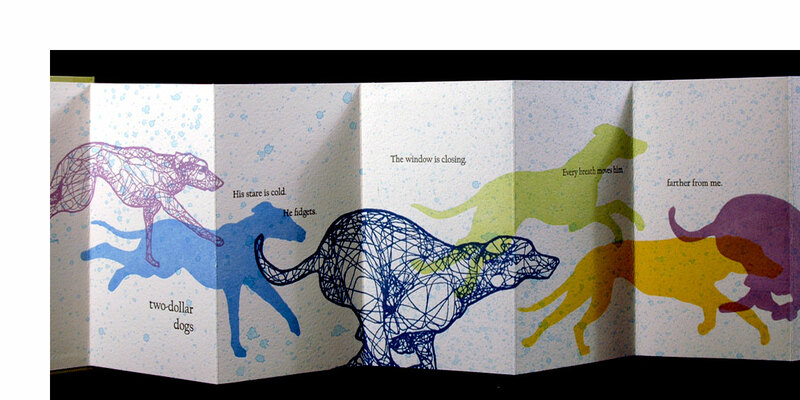 Firebrand Press: "With a narrative that alludes to a night at the dog track, two-dollar dogs is a blend of subtle text and dynamic images that explores the greyhound as a metaphor for love."